Text of talk presented at “Islam in Turkey Today,” a symposium sponsored by The Middle East Institute at Columbia University, the Turkish Cultural Center, and the Institute of Turkish Studies, November 2- 3, 2007, Columbia University, New York. th century movement in Turkey, it worth spending some time dwelling on the history of the Naqshbandiyyah and the place of Sufism in general in Islam and in Turkey. Like all Sufi orders, the Naqshbandiyyah derive their spiritual authority from a chain of initiation and guidance, a silsilah , which reaches back to the Prophet.The order takes its name from Baha al-Din Naqshband, who lived during the 14th century mostly in and around Bukhara and Transoxania. wahdat al-shuhud “oneness of perception”, as well as for his political activism. 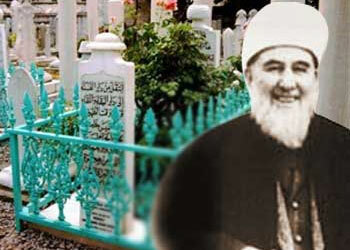 His written works and his life are second only to Baha al-Din Naqshand in the overall history of the order. The Mujaddidiyyah, as the branch begun by Sirhindi came to be known, spread to the Arab lands and beyond. In the early 1800’s a certain Khalid Bahgdadi from Kurdistan, after a spiritual encounter in Mecca, travelled to India where he became initiated into the Mujaddadi branch. He spent the latter part of his life in Baghdad and Syria, but his spiritual influence spread far and wide in the Ottoman lands, among Arabs, Kurds, within Anatolia, and as far as the Balkans. But the Khalidi branch was not the first to reach Istanbul. In the late 17th century a disciple of Sirhindi’s son Muhammad Ma‘sum, Murad al-Bukhari, came to Istanbul and was apparently well received by the seyh ul-islam and the upper classes of the city. Early in the 18th century a man named Ahmad Joryani, also known as Yekdest, travelled to India to be initiated by Sirhindi’s son Muhammad Ma‘sum. From his spiritual chain came the figure of Mehmet Emin b. Ismail (nicknamed Brusali). Mehmet Emin, as a scholar and commentator on the Mesnevi of Rumi and a clerk for the grand vizier at that time (1757-1763), put him close to the government and literary circles. The revolt against Sultan Selim III resulted in the persecution and execution of many of Mehmed Emin’s followers, but the Mujaddidiyyah continued their following and influence among the learned and beauracratic classes in Istanbul. Indeed, it seemed to be a guiding principle of the order, going back as far as Sirhindi, to be a positive religious influence upon rulers and upon the ruling classes, unlike some other Sufi orders which might emphasize detachment and separation from society and worldly power. Moreover, it tended to draw its ranks from the elite members of society. Shaykh Khalid wrote to one of his disciples, “Do not initiate into the order except distinguished ulama.” Khalid himself would quote a saying of Sirhindi, “The virtuousness of kings is the virtuousness of the subjects. Their corruption is the corruption of all the subjects.” Thus the Naqshbandi social program had a distinguishing feature of recognizing the role of the ruler in the moral and spiritual life of society, and of taking active steps in reforming the ruler as well as those over whom he ruled. Following the outbreak of the Greek Revolution in 1821 the Naqshbandis were affected by an unfolding drama involving the Bektashis, the Janissaries, and religious elite, and the Sultan. In 1826 Sultan Mehmet II abolished the Janissaries corps and outlawed the Bektashi order. This was framed as a move by the state and the religious establishment— “din ve devlet”—to cleanse the society of those who were endangering orthodox Islam. The Janissaries and Bektashis were accused of defying the ulama and weakening society’s link to Islam. The move by the Sultan had strong support among the beauracratic and clerical classes. There was a movement during this period towards there-establishment of Islamic orthodoxy and a spiritual renewal of society which was seen as having grown too lax and attached to material enjoyments. Indeed, another important feature of the Naqshbandi tariqah was a scrupulous observance of the shariah and a concern with reviving and living in accordance with the sunna of the Prophet Muhammad, and so the character of the order fit well with the larger pious trend. It appears that the fate of the Naqshbandis during this period, and their relationship with the Sultan, was mixed. Indeed, they would have favored the removal of anti-Islamic elements and a general renewal of the sunnah and Islamic practice, but there was the question of the degree to which the exaltation of the shariah placed a check on the power of the sultan. The orthodox sentiments of the upper classes helped the sultan to rid himself of the Janissaries and the Bektashis, but he would not have favored the expansion of a kind of republican ( juhmur tarzinda) Islamic government. The Khalidi’s were actively kept in check despite their following, and after the death of Shaykh Khalid they came to depend and be sustained by government support and patronage. They remained influential in Istanbul and other places, but not to the same degree of independence as during the time of Shaykh Khalid. ***The Naqshbandis naturally were opposed in principle to the tanzimat reforms of the middle part of the 19th century, geared as they were towards modernizing the empire along Western models. So when Sultan Abd al-Hamid later moved to reassert the Islamic dimensions of his role as Sultan, he had the support of the Naqshbandis. During this period the most important Nasqbandi figure was Shaykh Ziyaeddin Gümüshanevi, who fought in the Russo-Turkish war of 1877-1878, along with other Naqshbandi shaykhs.It is not surprising that by and large the Naqshbandis did not support the Young Turk revolution, although there were some exceptions to this. As a rule, the Naqshbandis were active in the First World War and the Turkish War of Independence, though they could not have reasonably foreseen the establishment of a political order which would eventually outlaw them. Indeed, by fighting on behalf of the state they were following the command of Shaykh Khalid to “pray for the survival of the exalted Ottoman state upon which depends Islam and for its victory over the enemies of religion.” Gümüshanevi commanded his disciples in terms of protecting the vatan’ din and devlet’. During the war against the occupying allied forces, Naqshbandis often protected high ranking officials in their tekkes. The most significant example of this is the protection of Ismet Inonu, close associate of Mustafa Kemal and later the second president of the Republic, in the Özbekler tekke in Uskudar. During that time the Naqshibandis played an important role in the mobilization of the populace against the occupiers. At this time figures such as Mustafa Kemal were still framing their activities in terms of protecting and upholding Islam and the Caliphate. Indeed there were several Naqshbandi shaykhs in the first Grand National Assembly, such as Servet Efendi (d.1962) and Hasan Fevzi Efendi (d. 1924). From the Naqshabandi point of view the situation took a turn for the worse with the radical secularizing and Westernizing reforms which followed in the wake of the War of Independence. The abolition of the caliphate and other measures taken to remove the Islamic character of the state led to several rebellions in the 1920’s and 1930’s, the most famous of which was the Shaykh Said rebellion of 1925. Many of the rebellions against the secularizing reforms were carried out by Naqshbandi groups, who saw the changes as destroying the role of religion. The Republican regime, for its part, framed the rebellions as conflicts between the forces of darkness and enlightenment. The State reacted to these rebellions by outlawing Sufi orders and clamping down on their organizing power. Sufi lodges were shut down or occupied for other purposes, such as being turned into “people’s houses” with a new secular nationalistic mandate. The period from the Shaykh Said rebellion until the 1950’s was perhaps the most difficult for Sufi orders, and for religion in general, in Turkey. As a general rule, the Naqshbandis were able to weather the storm of persecution better than other orders. Part of this stemmed from the principle, going back to Baha al-din and continued through Sirhindi and Khalid, of khalvat dar anjuman, or seclusion within society. The practice of khalwah meaning “seclusion” is a universal Sufi exercise of spending long periods of time completely alone in remembrance and meditation, often contrasted with jalwah , meaning to be out in the open, that is, together with other people. The doctrine of “seclusion within society”, together with the emphasis of Naqshbandis upon silent rather than vocal dhikr , and their emphasis on normative sunni law and theology, made it easier for them to continue their practice and association without attracting special attention. A Naqshbandi could more easily hide in plain sight, since he would have fewer distinctive practices such as the vocal hadras and semas of other orders such as the Helvati-Jerrahi and the Mevlevis. Thus, during the 1950’s, when the environment became more relaxed, the Naqshbandis were still a viable intellectual and spiritual presence in Turkey. ***In Istanbul the most influential branch of the Naqshbandiyyah is known as the Gumushanevi branch, which became centered in the Iskenderpasa mosque and became known as the Iskenderpasa Cemaati. Other important branches include the Erenköycemaati, the Ismail Aga group led by Mahmut Ustaosmanoglu, and the Menzil Cemaat of Adiyaman. Other groups such as the Sulemancilar are also Naqshbandi, but there are differences between them and the groups I just mentioned. For example, they stress a traditional, memorization based education unlike the study circles of the Naqshbandis and Nur movement. One of their noteworthy successes has been to create a vast dormitory system in Turkey, and they have considerable presence among the expatriate Turks in German.